Edgy flat, satin finish, band with faceted beveled edge. 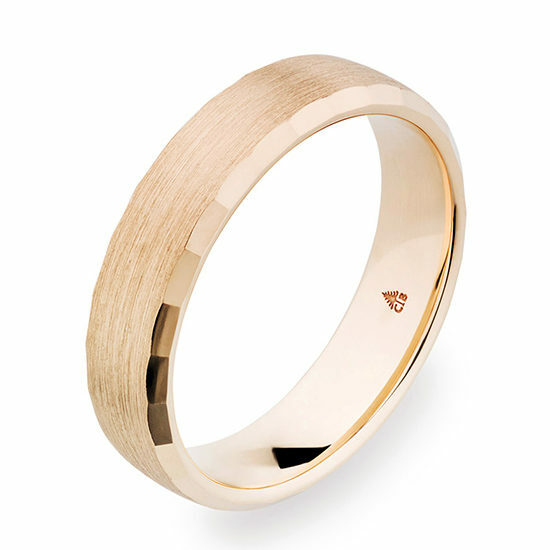 This 5.5 mm Christian Bauer men’s wedding band lets off a hint of sparkle despite it’s understated satin elegance. Ultra dense – this comfort fit men’s band is crafted to the natural shape of a man’s finger. Available in 14k and 18k rose gold. All Christian Bauer bands are hand made in Germany. This ring can be customized in additional widths and sizes. Call 212-566-8977 or write [email protected] for more information on custom orders.